Sometimes planning issues can get in the way of trying to run a business, so it’s always good when we can help a local company move forward with its expansion. 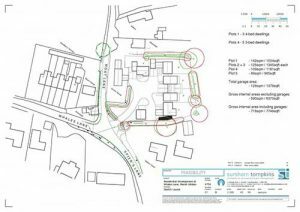 This month we have seen the culmination of a lengthy process, beginning in February 2012, when a business in Marsh Gibbon, Bucks, finally gained planning permission for the residential redevelopment of its site. The owner of the site is the fourth generation to run the business, and has been having problems both with accessibility to and from the site, and complaints from residents. Because of the site’s position and environs, there was limited opportunity for the business to grow. They wanted to redevelop the site with housing, and move the business on to a more suitable location. Our first task was to have pre-application talks with the Council. However, we wanted to use this as an opportunity to flush out any Council concerns therefore other specialist consultants were instructed on behalf of the client. First, our heritage consultant appraised the site and confirmed that there would be no adverse impact to the neighbouring Grade II listed house, and that the demolition of an adjacent red brick building, located within the employment site, should be regarded as acceptable, too. Next we needed to show that there was no commercial value in the site maintaining its business status, as the poor location and investment needed meant that a commercial operator or developer would not want to risk investment in the site. We did this to highlight that the normal requirement for an employment site to be marketed and for it to be shown there is no interest in continuing its authorised use was unnecessary. Lastly, an arborist confirmed that there would be no adverse affect on a nearby Oak tree, located on a shared boundary. The Council was initially averse to the idea and had a number of objections. Some of the concerns were acceptable, whereas others were not agreed by us. All these were taken into consideration however and the previous reports updated as part of a second round of discussions. These addressed the site layout for the five proposed houses, works that might be necessary to protect the Oak tree, updated information regarding commercial vacancy rates in the vicinity and greater in-depth research to the heritage of the red brick building; we also met with Aylesbury Vale District Council’s ecological officer to obtain his opinion on the site’s biodiversity status. This time we got the layout of the site, with five dwellings, agreed in principle, although the council remained firm on its other issues. At this stage, the site owner decided to go ahead with the planning application as he thought the case we had constructed was good. He was so convinced that the proposal was acceptable that he was also ready to argue it at appeal, should it be required. The application was duly submitted using the same reports as for the second round of pre-application discussions and to our delight we managed to convince the planning officer to support the application and for him to agree that all the previous objections were overcome. This did however involve us submitting a listed building application (part of a compromise we managed to negotiate) and getting consent for the red brick storage building to be demolished. 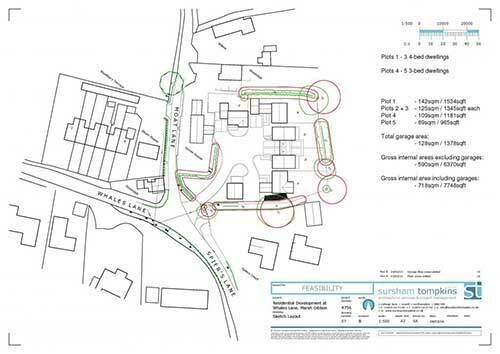 But we then also negotiated changes to get the layout of the parking area and the siting of the dwellings agreed, and overcoming local resident objections by showing that the character and appearance of the site would improve and the heavy goods vehicles would no longer be coming through the village. The outline application for five houses was agreed in principle some time ago, but it was held up by negotiations relating to a Section 106 agreement. This lengthy process of negotiation eventually worked in the client’s favour, since Government changes meant the proposed development became exempt from a need for developer contributions, resulting in the outline permission being issued. We are now helping the client to relocate his business. It was a lengthy process, but we got the result that will help this local business to expand, and will see the village of Marsh Gibbon lose those heavy goods vehicles. A win-win situation! 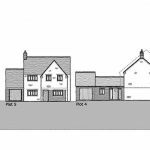 It is also testimony to developing a sound strategy for preparing a planning application and also to a client being confident in those acting on his behalf. If you would like to discuss your own project with us, please drop us a line at info@apexplanning.co.uk. (Partial) Drawings courtesy of Sursham Tompkins & Partners.